Barley, this incredible grain is used rarely in our cooking especially in Indian cuisine, but trust me they are very versatile and you can many delicious dishes from breakfasts to sweets. Initially i was one among those who dont like to take risk when its comes to culinary adventures,but now i know i'll definitely end up with something interesting if i get into trials. Actually barley was one among the wholegrains i never want to take earlier in my menu, when i came to know the health benefits of this grain, slowly i started adding them in many dishes. Now i can dish out anything with this grain, its been a while am making barley dosas at home which tastes and looks exactly like our usual regular dosas, the picture itself speaks a lot. Yes none yes none at home will notice the addition of barley here, i used pearl barley in this dosais for a better result. If you get whole barley grains dont forget to get them, feed your family with healthy stuffs. Whenever i ran out of snack foods like savouries or biscuits, i'll make crispy dosas for my kids for evening tiffins, they love crispy dosas than the spongy ones. Even its a single dosa, my lil one love very crispy dosas and he named it as Nizam dosa exactly as my brother used to call the thin crispy dosas, dunno why they named as though. Actually my brother named crispy thin dosas as nizam dosas when he was just 5yrs old and this name is still alive now coz of my lil one, but dont ask me the reason behind this name coz even i dont know. However coming to this Barley dosa, they makes an excellent breakfast, tiffin,dinner and they tastes simply awesome with any side dish. I served mine with both chutney and idly podi. Am running easy tiffins as this week's theme of blogging marathon hence am sending this crispies to this week's theme.Check out the Blogging Marathon page for the other Blogging Marathoners doing BM#42. Wash well and soak the rice and barley with enough water for 4hours. Soak the urad dal with fenugreek seeds separately for 4hours. Drain the water from urad dal and grind it as fine paste. Transfer the urad dal batter to a vessel and grind now the soaked barley- rice mixture. Grind them as bit coarse paste. Now mix both the urad dal batter with rice-barley batter, add salt and keep aside for overnite. After fermentation, give a stir. Heat a nonstick tawa or a pan for making dosas, once the pan is hot, grease the pan with a paper towel and oil, drop a ladle of this batter and spread as a thin dosa. Drizzle oil , flip and cook on both sides until the dosa turns crispy. Serve warm with chutneys or idlipodi. I love crispy Dosas and this is tempting me a lot :) Love the addition of barley..very healthy too. Healthy and delicious dosa, looks crispy too.. 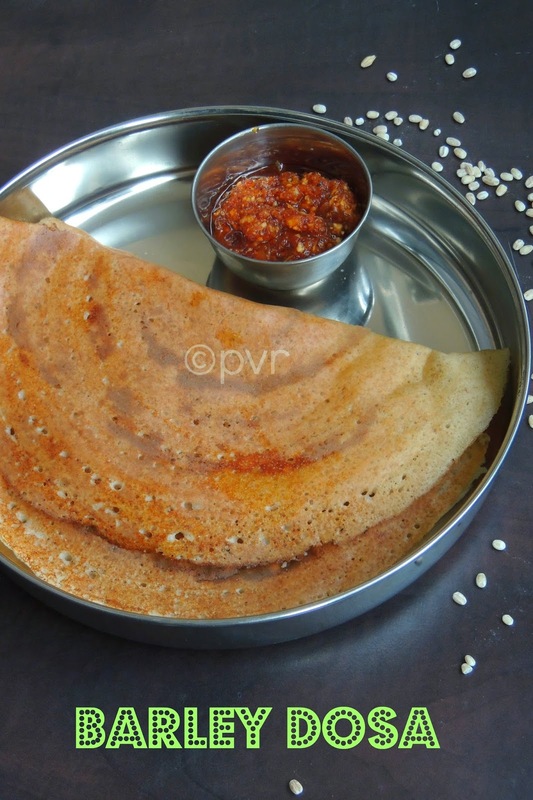 I have never cooked with barley Priya, the dosa looks so crispy and inviting..
never tried before looks very healthy and delish..
nice crispy dosa.. love it..
Crispy and healthy dosa....... Lovely!! 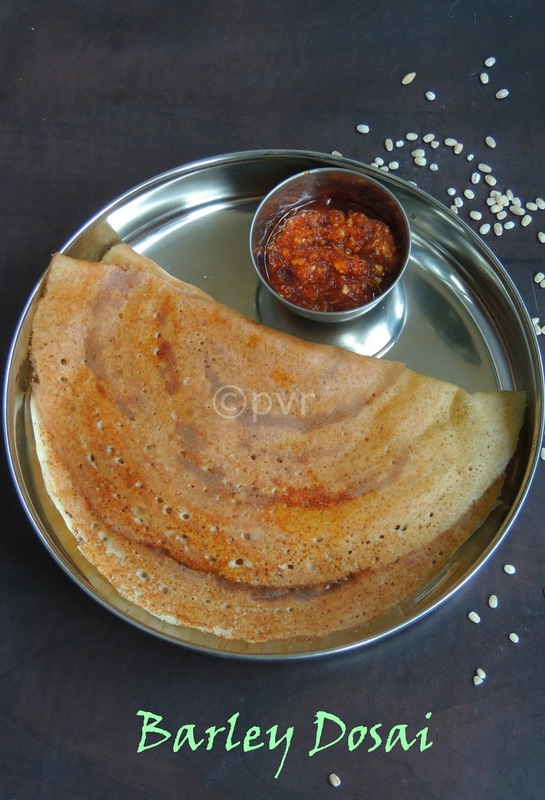 Have tried the instant adai version, this fermented barley dosa looks super crispy and inviting! will try it soon! Barley was one of my grandmothers favorite grain. It is great for growing children. Love the dosas you have made. Thin and crispy looks good! I love that nizami dosa..will give it a shot since hubby is fond of dosas. Rally novel. Nice variation to Dosa, will try this. Interesting recipe.. The dosa looks crispy. Tried your barley dosa & fell in love with it. Thanks for contributing this wonderful recipe. This is a keeper for sure. PARBOILED rice means idle rice ??? SB MM, yes its idli rice..